Do you always choose long braids and now want a change? Or maybe you are looking for a completely new hairstyle? If so, this is the place to be. 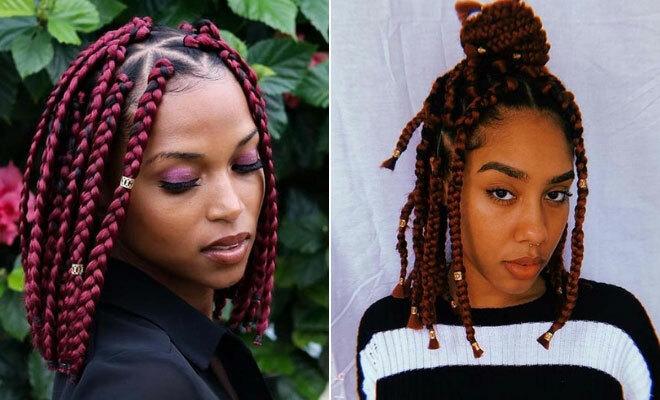 We have put together 23 of the most beautiful short box braid hairstyles. You will find cute bobs, accessorized braids, updos and more. There are also some cool color ideas too. Any one of these hairstyles will look amazing and with the summer approaching fast, it is the perfect time to try a new, shorter style. So, take a look! You won’t be able to choose your favorite as you will love them all! First up we have this chic braided bob. 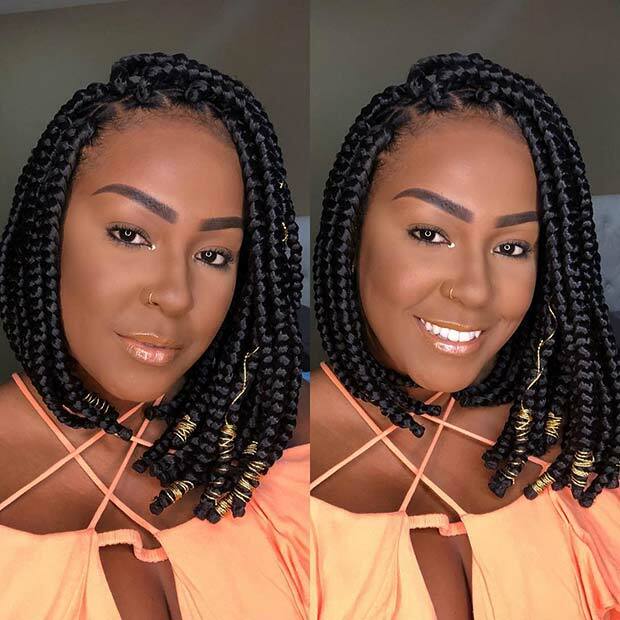 The hair has been styled into a side part and features simple and trendy box braids in a length that sits just below the chin. These braids are easy to wear and they will suit everyone. 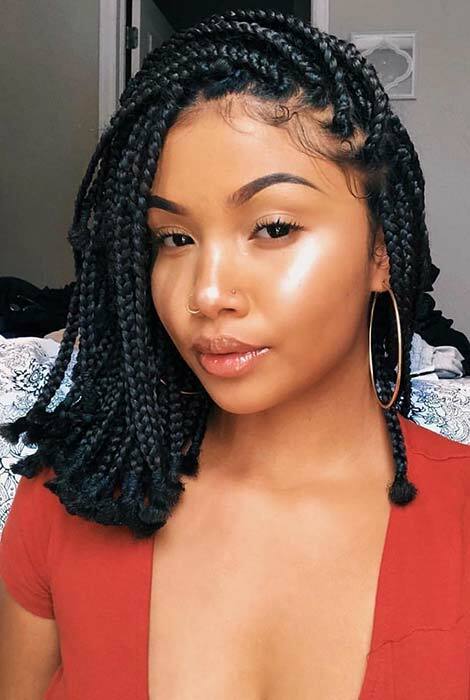 You can recreate this look or try using thicker braids, you can try different hair colors too. If you are starting to get a little bored of your hair then you can try something trendy like this! For this look the hair is styled into chunky braids with triangle partings. 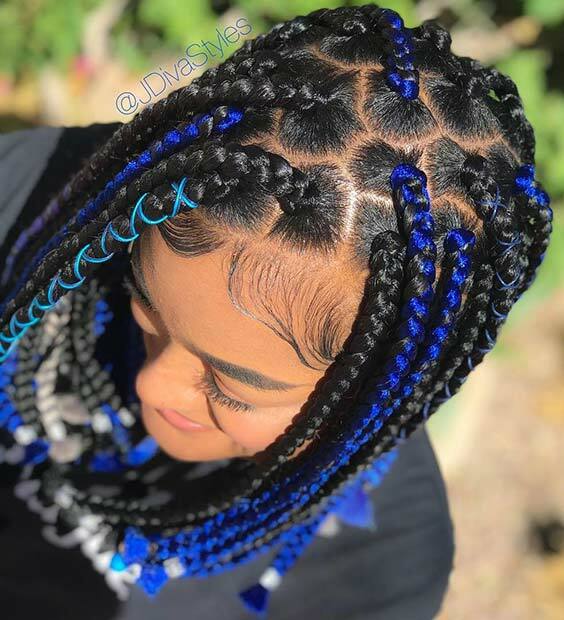 The braids are also a beautiful color too. This is a unique and stunning hairstyle that will make you stand out from the crowd. Try a similar style to this or you can try triangle part braids in a natural color. Either way, your hair will look amazing. Down below is the full video tutorial by Kersti Pitre. Make sure to check it out! Hair used: RastAfriBraid. Just because your braids are short it doesn’t mean that you have to miss out on stylish updos. You can create beautiful hairstyles with short braids and here is a great example. 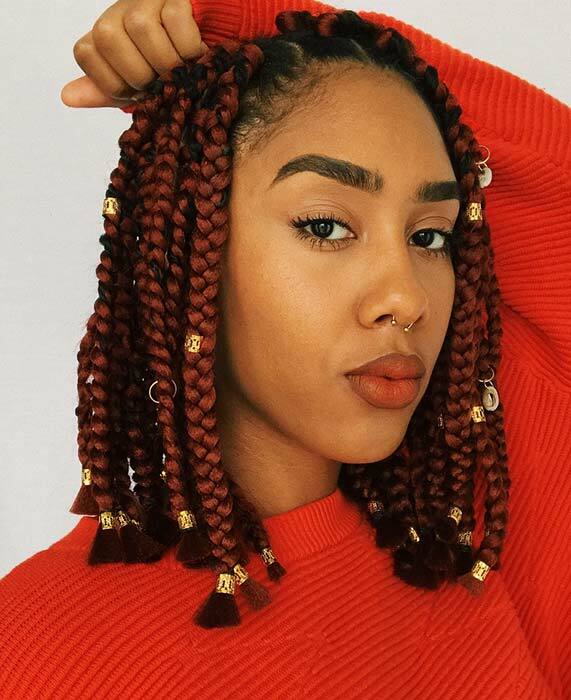 These braids have a length that sits just above the shoulders. Half of the braids are loose and half are styled into a high bun. As you can see, the braids look amazing in the bun and a style like this will suit every face shape. Next, we have a super stylish hair idea to show you. 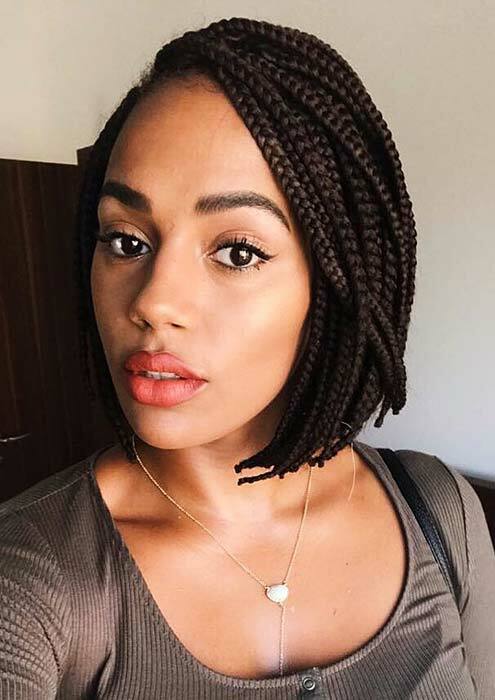 This is a jumbo box braid bob. It is a simple and beautiful hairstyle that will look amazing for any occasion. 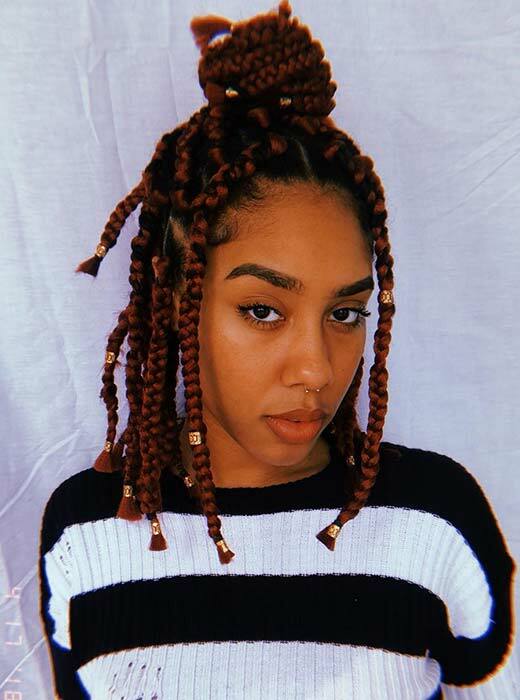 Recreate this style for an easy to wear bob or you can jazz it up by adding braids in different colors or by adding accessories. Looking for a bolder hairstyle to try? Then you need to check out this next look. The hair is braided into chunky box braids with funky partings. Some of the braids have electric blue hair weaved into them and one braid is accessorized with a blue cord too. This is a vibrant hairstyle that is perfect for the ladies that want to make a statement. Recreate the beautiful blue look or try a color of your choice. Bobs can be created in different lengths and thicknesses. A stylish length you should consider trying is chin length. This bob is a beautiful example. The hair is styled into box braids and they end just under the chin. As you can see, this creates a chic and trendy hairstyle. You can recreate the accessorized version or try simple braids without the cord. You can glam up any braided hairstyle with hair cuffs. Don’t just take our word for it, check out this next look. Here we have a braided long bob that has been styled with lots of gold hair cuffs. The accessories are so stylish and make the classic braided bob look unique. You can buy hair cuffs online and you can choose from different colors and styles. 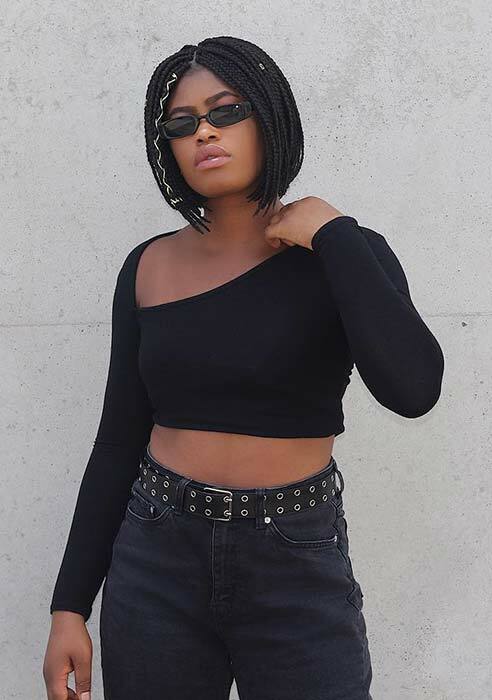 Learn how to revamp your long box braids into these short ones with the help of Tommie’s YouTube tutorial down below. The next hairstyle we have to show you is so stylish and beautiful. 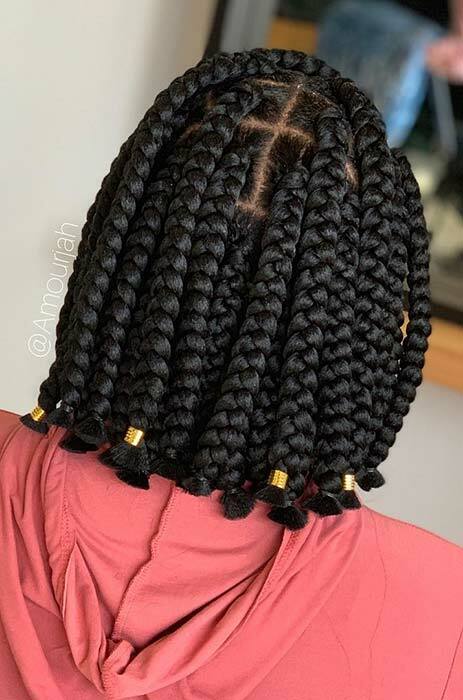 Here we have a box braid bob where the braids have been swept to one side. By having all the braids styled this way, you get a chic and glam look. A hairstyle like this can be worn for any occasion and it will keep you looking trendy every day. Another cool way to make your hair stand out from the crowd is by choosing stylish a hair color just like this. This braided style features stunning red box braids and it is finished off with gold accessories. The hair would look fabulous with just the red color but the gold accessories compliment the color perfectly. 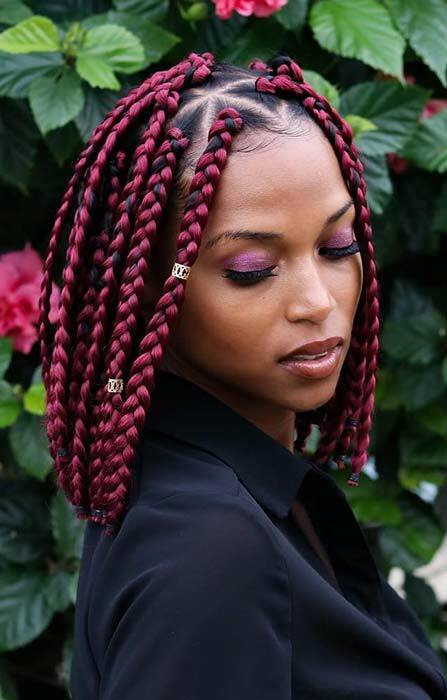 Red braids like these will suit everyone and you can recreate this shade or go for a lighter or darker tone. Next, we have a cute and chic bob. 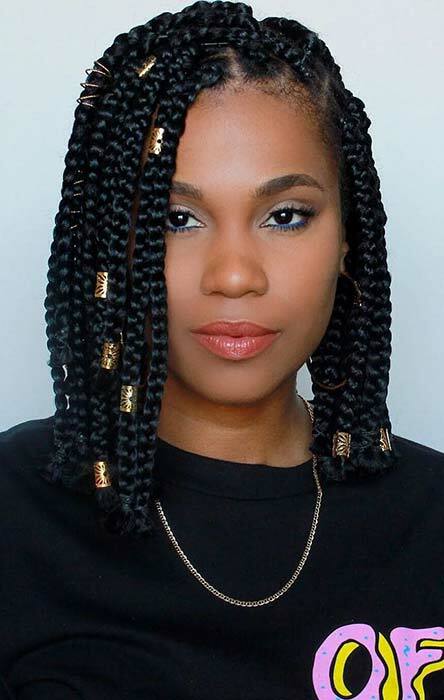 For this look, the hair is parted on the side and it is braided into beautiful box braids. The bob is finished off with glam gold hair cords. It is just a super stylish bob that is easy to wear. Recreate this look or add your own accessories to make the bob unique to you.